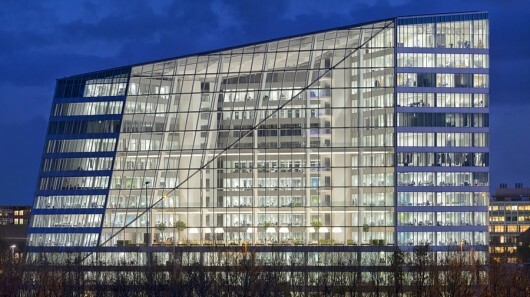 We’ve had other claimants to the title of the world’s most sustainable office building, but The Edge in Amsterdam has a the credentials: the highest environmental performance score ever given to a building by international assessor the Building Research Establishment (BRE). That’s a very precise score of 98.36, in case you were wondering. The roof is covered with solar panels. So are all the gaps between the windows on the southern facade. That makes the building energy neutral. For heating and cooling, it uses an aquifer thermal energy storage 130 m. below the ground. Rainwater is captured to flush toilets and irrigate the ‘nature corridor’ and gardens that surround the building. A global first for the building is that it uses an ethernet powered LED lighting system, which means that occupants control the lighting with their mobile phones. Impressively, the mobile phone connects directly to the light fittings through code transmitted in the light itself. That’s convenient, and it also captures lots of data about how the building is used. Philips can tell you more about their ‘digital ceiling’ here. Like all the best sustainable buildings it combines new technology with old ideas. Yes, it has cutting edge lighting, but it’s also oriented to maximise natural light so that you’ll need it as little as possible. How you live in a building is a big part of whether or not it can be considered sustainable, with transport being the most important element. Deloitte, who will occupy The Edge, have made the most of Amsterdam’s established cycling infrastructure and installed parking for 500 bikes. There are lots more photos and a video tour on The Edge website.